Homemade classic tuna casserole, the quintessential American dish. This is made from scratch, and under $10 to make! 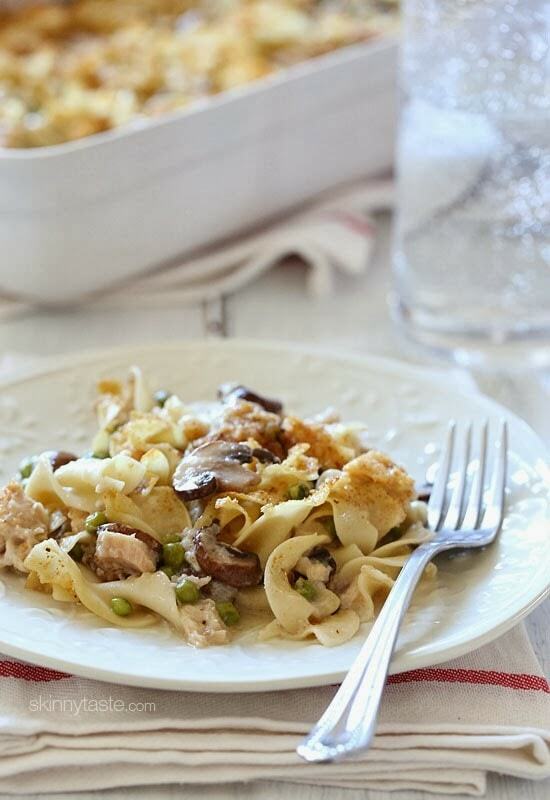 Made with canned tuna, mushrooms, peas and noodles in a creamy sauce (without canned soup) finished with toasted breadcrumbs – this is the best tuna noodle casserole – the kids love it! Other casserole ideas you might enjoy are Chicken Sausage and Peppers Macaroni Casserole, Spiralized Turnip and Potato Au Gratin Casserole with Turkey and Sicilian Rice Ball Casserole. The first time I tried tuna casserole was back in 2011. Yes, you heard me right! In fact, when I told my daughter what we were having, she warned me she may be eating something else tonight. The good news is we all LOVED it, and I’ve made it for my family many times since then. For those of you who haven’t tried this yet, I originally posted this back in 2011 after getting many requests for a lighter version. Now it’s become quite popular on my site. You can easily adapt this with different vegetables, swap the tuna for chicken, use whole wheat noodles – no rules to cooking, just have fun with it. How do you make homemade tuna casserole from scratch? You start by making a simple white sauce which eliminates the need for processed canned soup. Add any veggies you wish here. In this recipe I used peas and mushrooms, you can swap them out for broccoli, asparagus, carrots, etc. 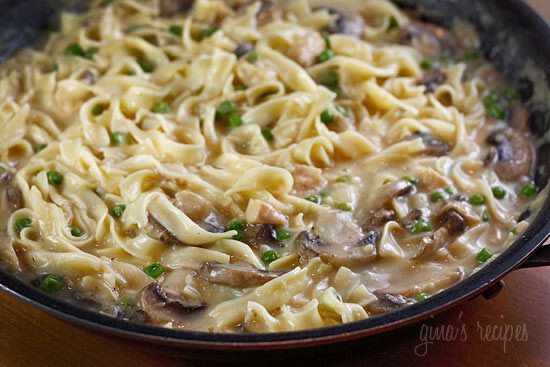 You can swap the egg noodles for whole wheat if you wish. If you don’t like tuna fish, you can even use chicken or salmon. Can you freeze a tuna casserole? Yes, there’s two ways to freeze it. A make-ahead method or you can freeze the leftovers. For the make-ahead method, prepare everything up to the point of baking. Once you’ve combined everything with the exception of the breadcrumbs and Parmesan, transfer to a freezer bag or freezer safe container. When you’re ready to serve the tuna casserole, defrost the mixture in the refrigerator overnight, top with Parmesan and bread crumbs and and bake. Leftover, oven-baked tuna casserole can also be frozen. To do so you’ll want to flash-freeze the leftovers for a few hours in the original baking dish, then when it’s solid, remove it from the pan, place it in a freezer bag, and return it to the freezer. To cook, thaw overnight in the refrigerator and reheat. Tuna casserole, the quintessential American dish. Perfect for potlucks and under $10 to make. 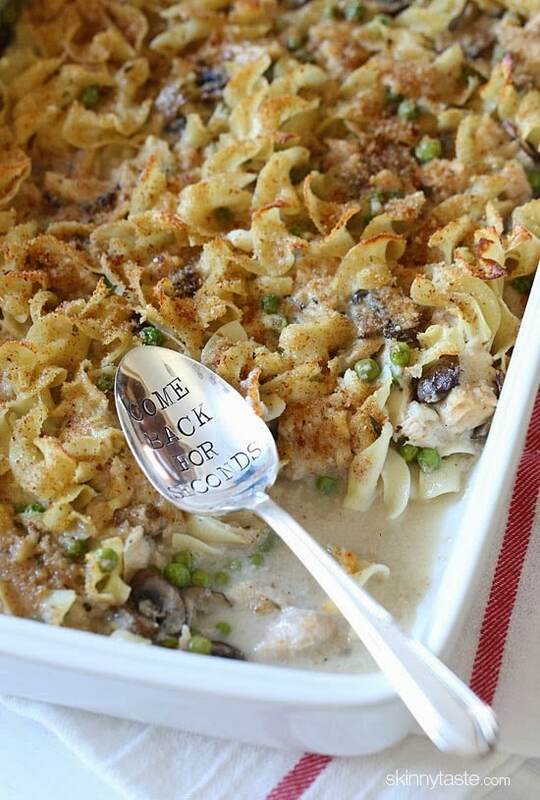 Made with canned tuna, mushrooms, peas and noodles in a creamy sauce (and no canned soup) finished with toasted breadcrumbs – so good! Melt the butter in a large deep skillet. Add onions and cook on medium heat until soft, about 5 minutes. Preheat oven to 375°. Lightly spray 9 x 12 casserole with butter flavored cooking spray. Slowly whisk in the chicken broth until well combined, increasing heat to medium and whisking well for 30 seconds, then add the milk and bring to a boil. When boiling, add sherry, mushrooms and petite peas, adjust salt and pepper to taste and simmer on medium, mixing occasionally until it thickens (about 7 to 9 minutes). Add drained tuna, stirring another minute. Remove from heat and add 1 cup reduced fat sharp cheddar and mix well until it melts. Add the noodles to the sauce and mix well until evenly coated. Pour into casserole and top with parmesan cheese and breadcrumbs. Spray a little more cooking spray and top and bake for about 25 minutes. Place under the broiler a few minutes to get the crumbs crisp (careful not to burn).